Oblivious Prevents the Pok�mon from becoming infatuated. This Pokemon cannot become Attracted. Snow Cloak Raises evasion in a hailstorm. 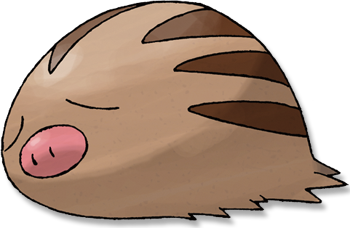 This Pokemon's Evasion rises one level during Hail. Thick Fat* Raises resistance to Fire-and Ice-type moves. Fire and Ice moves only do half damage against this Pokemon. the cover of dead grass. This POK�MON occasionally roots out hot springs. Emerald It roots for food by rubbing its snout against the ground. Its favorite food is a mushroom that grows under dried grass. It occasionally roots out hot springs. Leaf Green It rubs its snout on the ground to find and dig up food. It sometimes discovers hot springs. Diamond/Pearl It loves eating mushrooms that grow under dead grass. It also finds hot springs while foraging. Platinum It has a very sensitive nose. It can locate mushrooms, berries, and even hot springs buried under ice. Heart Gold It rubs its snout on the ground to find and dig up food. It sometimes discovers hot springs. Soul Silver If it smells something enticing, it dashes off headlong to find the source of the aroma. Black It has a very sensitive nose. It can locate mushrooms, berries, and even hot springs buried under ice. White It has a very sensitive nose. It can locate mushrooms, berries, and even hot springs buried under ice.